Weekly pool maintenance is necessary if you want your swimming pool to last for a long time. This is particularly true within the Coachella Valley, where the perpetually sunny weather combine to make pools prone to algae buildup. That is not to mention the windy, dusty environment that results in dirt and debris regularly finding their way to your pool. The pool water itself will most likely be full of leaves and debris. A skimmer will do the job here, as well as manually picking up any debris that the skimmer can’t handle. This task should be the most straightforward, but it will still require a lot of elbow grease. Next, you should use a vacuum to remove any dirt or debris from the floor of the pool liner. This may require some careful consideration because not all vacuums can handle accidentally sucking moist or wet material (or even water), which is a possibility if you are vacuuming so close to the pool. This is done in order to prevent the filter from breaking under too much pressure. The good thing about this is that this step only needs to be done every other week. 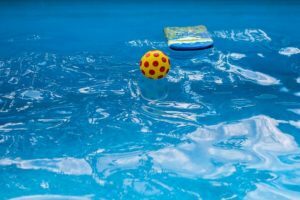 If it isn’t obvious from the checklist above, weekly pool maintenance is time consuming and some parts of the process require training and expertise. If you are a simple pool owner who just wants to enjoy a dip or two during a hot day, it is smarter and more efficient to just hire a professional pool service company like CV Pools. CV Pools is one of the leading pool service companies in the area. We will save you time and money and get everything done properly the first time. Contact us today and we will give you a FREE quote.